Easy to schedule: Use your calendar and add meet@chime.aws to your meeting invite. Adding meet@chime.aws will enable Chime to call you so you can ensure your meetings start on time. Personalized meeting links: Create and use personalized meeting URLs for your online meetings. Simplified join experience: Join with a simple tap, and avoid the need for lengthy passcodes, or choose “Running Late” to let everyone know you're running behind schedule. Join Meetings with Alexa: You can simply say “Alexa, start my meeting”, and Alexa gets your meeting started. Learn more about Alexa for Business. Amazon Chime call me: With Amazon Chime call me, you simply enter your phone number in the web application and answer the incoming call to join a meeting. Dial-in: Amazon Chime offers dial-in numbers in over 80 countries and low per minute rates. For more information on Dial-in rates, please visit the Dial-in rates page. Screen share: You can share your screen or present information, without requesting permission. 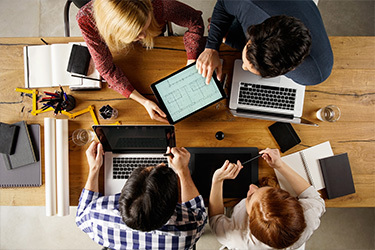 You can also allow remote control of a screen share for richer collaboration. Visual roster: The visual roster lets you see who has joined or declined the meeting, who is running late, who is currently speaking, and lets you see where background noise is coming from so you mute that line. Video Tiles: You can enable video with one click to interact with your meeting attendees visually. Amazon Chime supports picture-in-picture for 1:1 meetings and featured video. 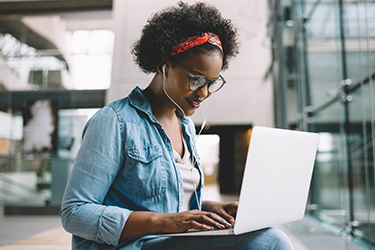 Record your meetings: Amazon Chime allows you to record your meetings so that you can share important meetings with colleagues and replay as needed. Video conferencing: You can use high-quality wideband audio and high-definition video conferencing for up to 16 people on your desktop, or 8 people on mobile devices. 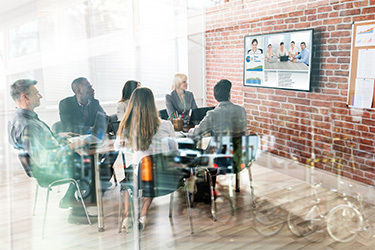 Conference room video systems: Amazon Chime supports most Session Initiation Protocol (SIP) and H.323 video conferencing systems, and meeting participants can join meetings by simply entering the meeting ID into the device console. Chat: You can use Amazon Chime to chat with colleagues directly, in a group, or in a chat room. You can share attachments up to 50 megabytes, search contacts, conversations, and chat rooms, and read conversations across all devices. Chat rooms: Chat Rooms can be created to enable multiple users to collaborate on projects, share files with colleagues, and use @mentions to direct messages to specific participants. There is no limit to the number of users that can be invited to a chat room and individual users can join as many chat rooms as needed. 1:1 voice and video calls: You can make instant person-to-person voice and video calls (VoIP) letting you quickly escalate from messaging to voice or video chat as needed. Smart Presence: Amazon Chime uses smart presence to indicate your status, where green means you’re available, and red means you’re busy. You can also manually set your presence to indicate that you’re not available, or hide your presence status entirely. Incoming Web Hooks: Developers can configure their applications to use incoming webhooks to post messages into Amazon Chime chat rooms. Single Application: You can place and receive phone calls and send and receive text messages directly from the Amazon Chime application. Receive Phone Calls: Calls to your phone number ring will ring the Chime app on all of your devices -- across desktop, mobile, or web. Just answer on one device and the others will stop ringing. Text Messaging: Send and receive text and picture messages with more than 100 countries. Text messages have the same look and feel as a Chime chat. 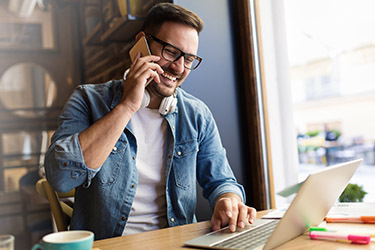 Switch Between Devices: From the Chime application, you can switch active calls between mobile and desktop devices without interrupting your conversation. Turns Calls into Meetings: You can add additional participants to your 1:1 phone call to turn it into a Chime meeting, regardless of whether they are using the Chime application or their telephones. Voicemail: When you are unable to answer an incoming call, Chime voicemail will answer it for you. Voicemails are captured and can be accessed directly in the Chime application. 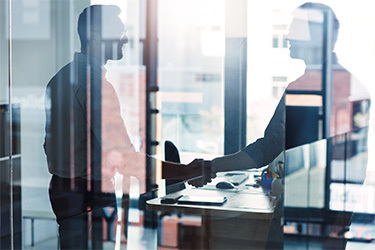 Standards-based: Supports the standards-based Session Initiation Protocol (SIP) to connect your on-premises phone system to the public switched telephone network (PSTN). Access Options: Voice Connector uses your Internet connection or AWS Direct Connect to carry voice traffic. Inbound Calling: Callers can reach on-premises phone system extensions directly through direct-in-ward dial (DID) telephone numbers. The service supports up to 10 unique routes to your PBX for failover and load sharing. You can choose to use Voice Connecter for just inbound calling or with outbound calling. Outbound Calling: Call domestically and internationally to over 100 countries. 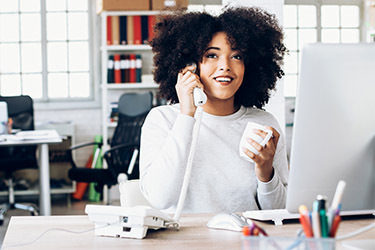 Two security mechanisms are supported to ensure that only your PBX can make outbound calls on your voice connector, including Internet Protocol (IP) whitelisting, and Session Initiation Protocol (SIP) authentication. You can choose to use Voice Connector for just outbound calling or with inbound calling. Built on AWS Cloud: Amazon Chime is an AWS service, which means you benefit from a data center and network architecture built to meet the requirements of the most security-sensitive organizations. In addition, Amazon Chime features security capabilities built directly into the service. Encryption: Messages, voice, video, and content are encrypted using AES 256-bit encryption. AWS CoudTrail Integration: You can log, continuously monitor, and record account activity related to actions taken in the Amazon Chime console, using AWS CloudTrail. Claim your domain: Automatically add users to your account as they sign up for Amazon Chime. Single Sign On: Integrate with AWS Directory Services for Microsoft Active Directory or Okta SSO to authenticate and manage users. Users can use existing crentials to log in to Amazon Chime. Details about AWS Directory service pricing can be found here. User management: Assign the right level of permissions to your users, add or suspend users, and reset meeting ID's as needed. You can force logout on all devices. Reporting: A reporting dashboard with usage and feedback data is available in the Amazon Chime admin console. You can click through to learn which meetings occurred, the meeting duration, and the attendee list for each meeting. Call Detail Records: You can set up your own Amazon Simple Storage Service (Amazon S3) bucket to receive your Call Detail Records for call and usage analytics. Amazon Chime offers pay-per-use pricing so you never pay for features you don't use.